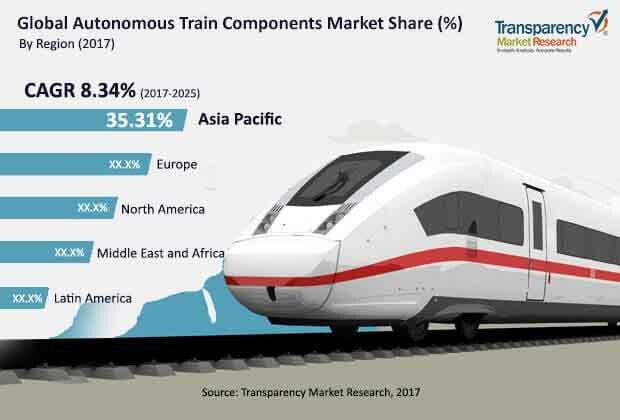 According to a new market report published by Transparency Market Research “Autonomous Trains Components Market – Global Industry Analysis, Size, Share, Growth, Trends, and Forecast, 2017–2025. According to the report, the global autonomous trains components market is expected to expand at a CAGR of more than 8.0 % during the forecast period. In railway transport systems, autonomous trains are a highly sophisticated technology, which offers a significantly less polluting and economical mode of transportation. Therefore, governments of various nations are focusing on the development of autonomous trains. Adoption of automation in trains is likely to boost the autonomous trains components market during the forecast period due to rising government support. Key drivers of the autonomous trains components market are increasing demand for safety, reduction in pollution, and government support. Currently, in emerging autonomous trains, operations are monitored and controlled automatically. Even critical decisions such as when to run and stop the train are decided by the automated control system, without any human intervention. Autonomous trains are also equipped with an automatic train protection (ATP) system that has the ability to automatically stop at signals and serves the purpose of speed control, resulting in increased safety and reliability. Autonomous trains are equipped with advance electronic appliances and onboard computer systems in order to provide accurate information about position, speed, and time. The data is collected from sensors that are monitored at control rooms, which in turn enables the autonomous system to make an informed decision. Rising urbanization in developing countries is boosting the demand for faster and economical trains. This, in turn, is fueling the adoption and incorporation of autonomous trains. Considering these factors, governments across the globe are focusing on adoption of automation in trains. This can be witnessed from the increasing number of rail transit systems. Autonomous trains are expected to witness significant growth owing to their wide variety of applications, which includes metros, subway, and monorails. Based on components, the LiDAR module segment dominated the autonomous trains components market, and accounted for a prominent share of the market, in terms of revenue. The LiDAR module is a key component of the autonomous train, which performs the function of recognizing obstacles or objects. Emphasis of governments on safer and economical mode of transportation, in order to cater to the demand for efficient transportation, is boosting the autonomous train components market with more reliable and superior components. The GoA1+ GoA2 segment accounted for a major share of the autonomous trains components market, in terms of automated tracks, globally. The segment is anticipated to expand at a CAGR of 12.2% by 2025. The segment is expected to account for 11598 Km of automated tracks by 2025. The primary reason for the expansion of this segment is the low cost required for automation to this grade of automation. The GoA3 segment is considered as a driverless segment. This segment accounted for 2868 Km and is anticipated to expand at a CAGR of 13.2% during the forecast period. This segment is anticipated to reach 7758.1 Km by 2025. The highest grade of automation, GoA4 is considered as unattended type of train. These trains are highly sophisticated, wherein every operation of the train is performed based on the information available from sensors in real-time. The GoA4 segment accounted for 877 Km in 2016. The segment is anticipated to expand at a CAGR of 13.5% during the forecast period. In terms of train type, the autonomous trains components market can be segmented into long distance trains, suburban, tram, monorail, and subway/metro. The subway/metro segment accounted for a major share of the autonomous trains components market, with a figure of 3676.6 Km. This segment witnessed a considerable demand for automation, which in turn is likely to expand at a CAGR of 11.8% during the forecast period. The subway/metro segment is followed by the suburban segment, which accounted for 2274.6 Km in 2016. This segment is estimated for expand at a CAGR of 12.6% during the forecast period. In terms of region, the autonomous trains components market has been classified into North America, Europe, Asia Pacific, Middle East & Africa, and Latin America. In terms of region, Asia Pacific accounted for a prominent share of the global autonomous trains components market owing to the high government support and higher rate of adoption of autonomous trains. In 2016, Asia Pacific accounted for total autonomous track length of 2783.3 Km followed by the Europe, which accounted for 2417.5 Km. The market in Middle East & Africa is projected to expand at a CAGR of 14.9% during the forecast period. Key players operating in the global autonomous trains components market include Thales Group, Alstom S.A., Hitachi Ltd., Bombardier Transportation, Ansaldo STS, SIEMENS AG, Mitsubishi Electric, and CRRC Corporation Limited. Bombardier Transportation and Thales Groups hold a major share of the market, as compared to other market players. The transportation segment of Bombardier, plans to reach its 2020 target of more than US$ 10 Bn of revenue. Furthermore, the company moved its transportation headquarters from Montréal, Canada to Berlin, Germany. This move is anticipated to strengthen the company’s capability to serve Europe. The Thales Group has self-funded R&D centers in 19 countries in Europe, North America, Asia, and Australia and 20 joint research labs with institutional partners worldwide. The Thales Group provides complete solutions to support its rail transport customers in every aspect of digital transformation.